Teela Books is an indie publisher of gambling and miscellaneous non-fiction books. Our books are available in paperback on Amazon. In addition, our books are available in digital format. Most of them are available in the Amazon Kindle catalog, and unless otherwise noted, they are available on the following platforms: iBooks, Barnes & Noble, kobo, Scribd, 24 Symbols, Inktera, Indigo, Overdrive, Playster and Tolino. You can find a complete listing of all our books here on our catalog page. Recently, I was at the Mandalay Bay hotel, having a cup of coffee at the Starbucks near the escalator that takes you to a passage that leads to the Luxor and a few retail shops along the way. Sitting there drinking my coffee, a decorative wall caught my eye. 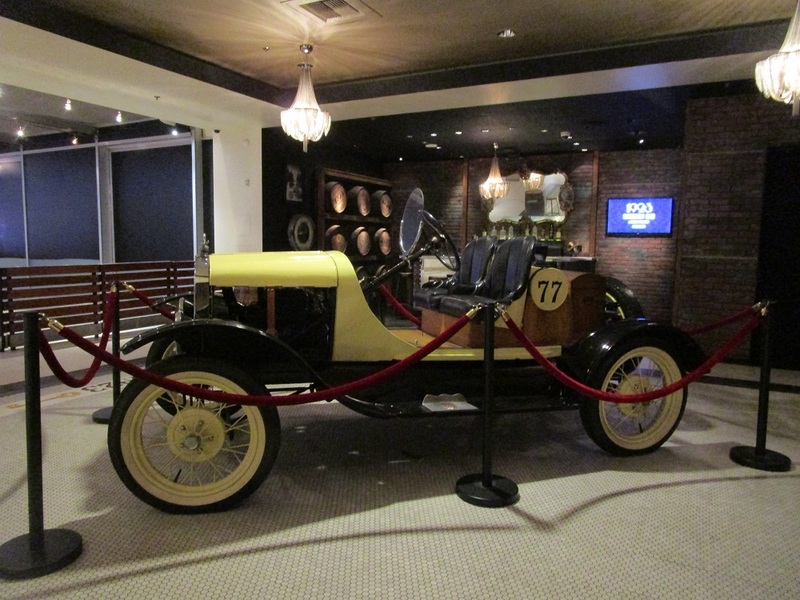 As I followed the wall with my eye, I noticed an antique car. The type made in the early 1920s. What was it doing there? I got up to get a better view, and there was a replication of an old bar and displays of old bottles of whiskey. But this was on the outside. 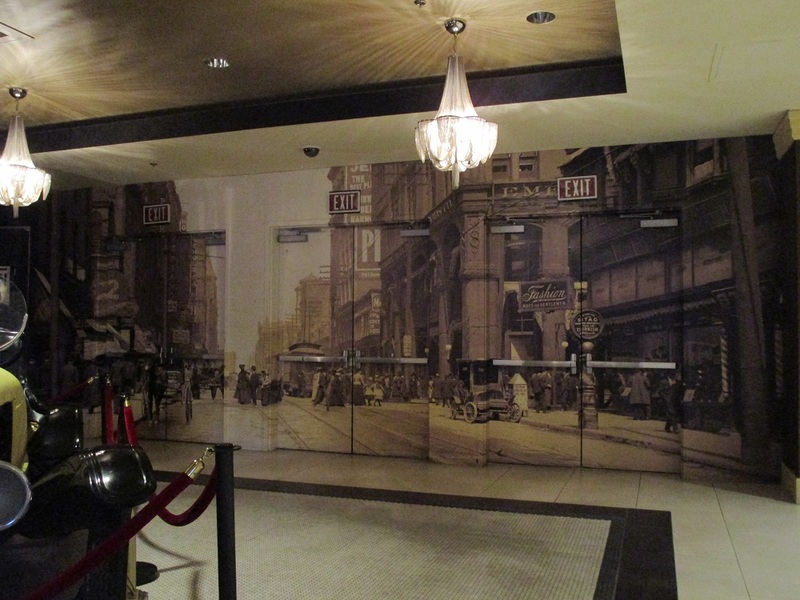 There is a door that led to a real bar called the 1923 Bourbon Bar. 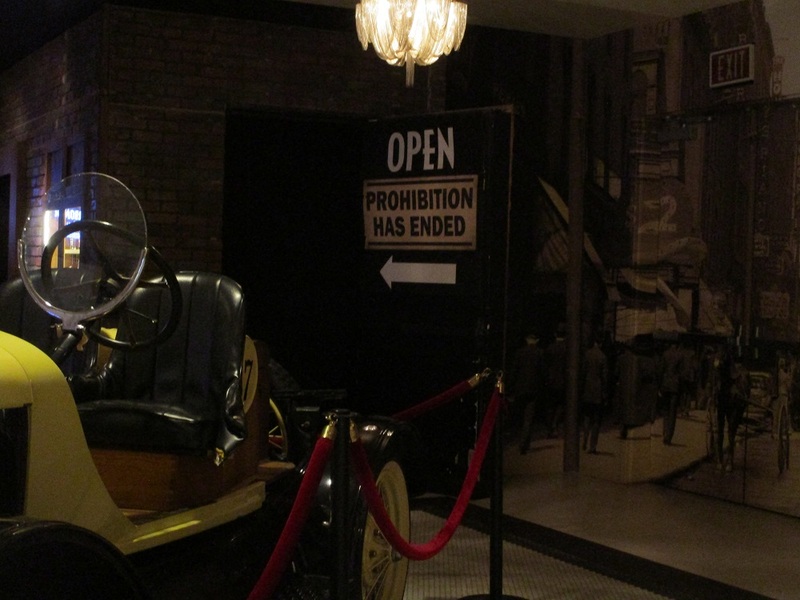 It is made to have the feel of a speakeasy. The type of establishment that sold whiskey at a time when it was illegal. All of the spirits in this bar are bourbon. There are a wide variety of mixed drinks available that use bourbon, or you can have a name brand American bourbon, straight up. I’ve never been a fan of Kentucky bourbon because it has a sour aftertaste. But they do serve the Tennessee variety, such as Jack Daniels that is charcoal filtered, making it more palpable to me. It’s strange to me that even though I live in Las Vegas and stay abreast of all the new things that are happening in the city, I still find little things tucked away that I’ve never noticed before. A new Las Vegas sign has been built. 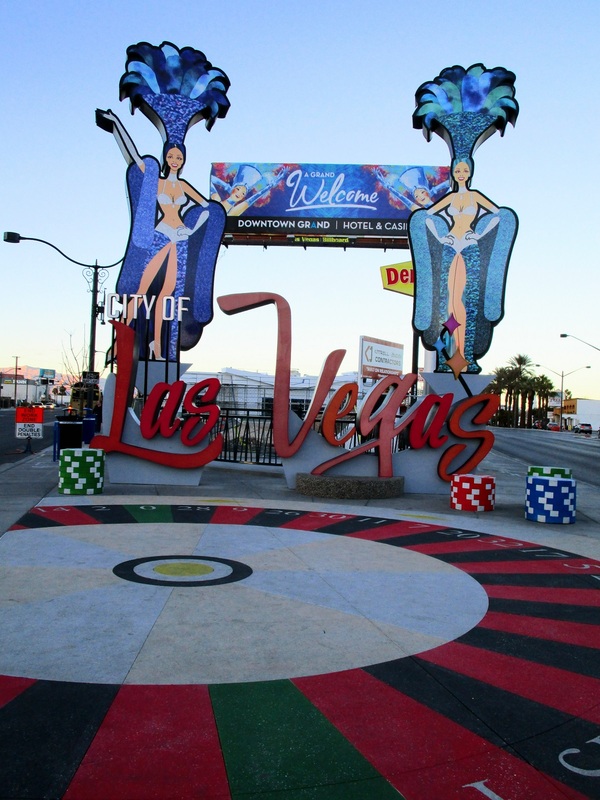 This one is a bit different from the iconic sign that you see as you approach the Strip from the south. This sign is for the city of Las Vegas. This can be confusing because most people associate the Strip with Las Vegas, but technically, the Strip resides in an unincorporated part of Clark County. Traveling down Las Vegas Blvd., you don’t reach the city of Las Vegas until after you cross over Sahara Ave. This means that every major hotel and casino on the Strip is not technically in Las Vegas, except the Stratosphere, and it is here that the city of Las Vegas sign was erected. It is on the corner of the intersection of Las Vegas Blvd and Main St. You can make a left and take Main St. to Downtown Las Vegas. This will take you to the Plaza hotel. If you continue along Las Vegas Blvd. to the right of the sign, it turns into Fifth Street. This is where the Fremont Experience begins. Unlike the Welcome to Las Vegas sign, there is no parking here. However, at the time of this writing, the Stratosphere (now renamed The Strat) still offered free parking in their parking garage. They are one of the few casinos on the Strip that still does this. 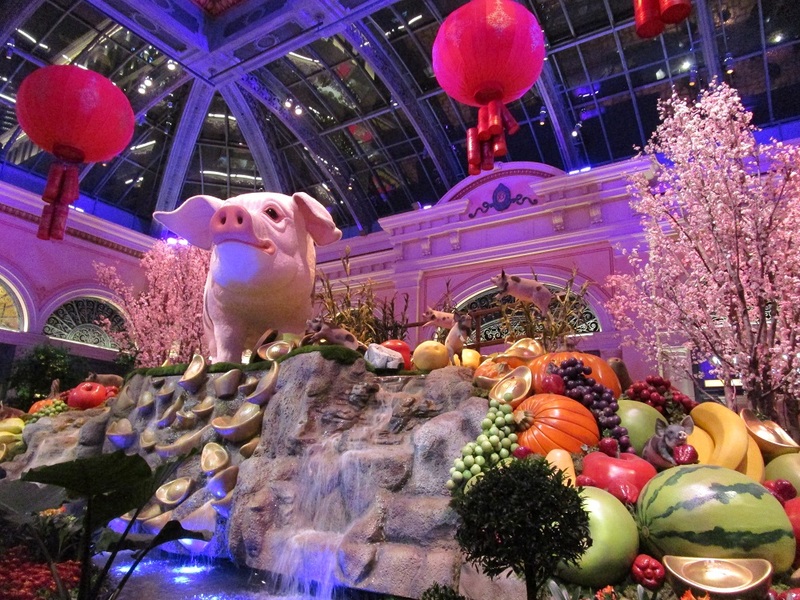 This is the Chinese New Year, and it is the year of the pig. 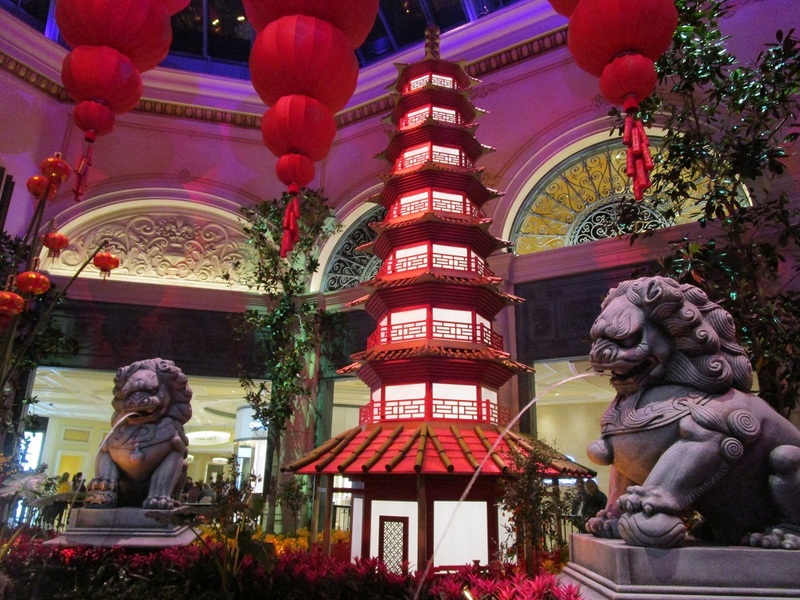 Here are a few photos of the conservatory at the Bellagio that is decorated to celebrate this. 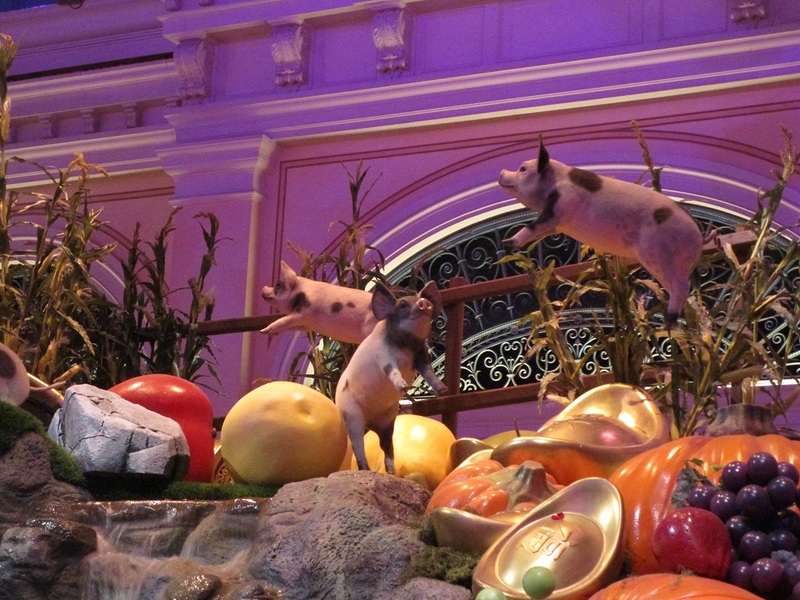 In this first photo, there is a large pig. For some reason, the pig doesn’t seem happy. There were some small piglets that were moving as if they were flying. Here is one last photo of a corner of the room. The conservatory is redecorated at various times of the year to reflect an important part of the year. It is always free to visit. 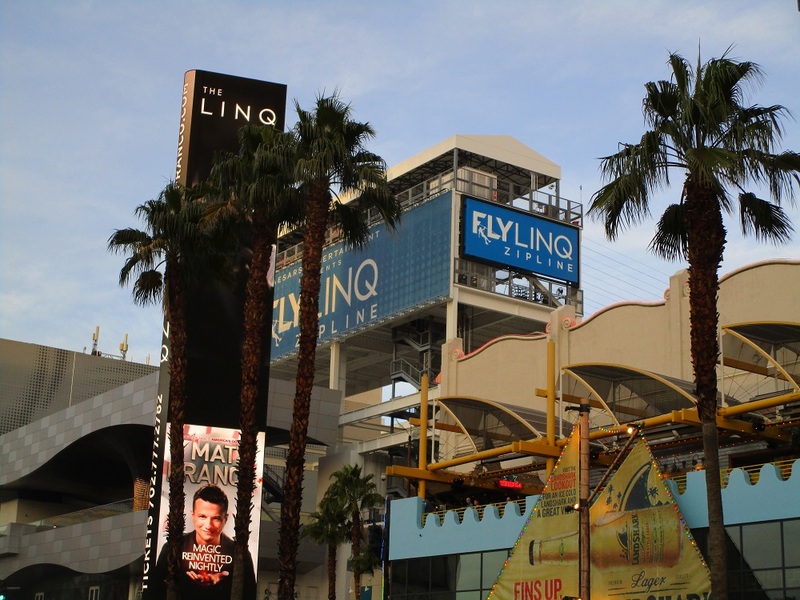 The Fly LINQ zipline is a new attraction on the Strip. It’s located above the LINQ Promenade and travels from just inside the entrance of the promenade and ends at the High Roller. It is similar to the Slotzilla zipline in Downtown Las Vegas, but this one is much higher. They claim it is seven stories high, and judging by the nearby Flamingo, this is about right. They offer both the seated ride along with the superhero. The latter position has you flat like you’re Superman, flying through the sky. Unlike Slotzilla, the distance traveled for either seated or superhero is the same, as well as the height. There are restrictions on who can ride. You must be a minimum of 40 inches (1.016 meters) tall. You must be at least 12 years old, but if under 18, a parent will need to sign a waiver form. Basically, they charge more when it gets dark. But right now it is winter time, so there will likely be time changes as the summer draws near. The latest information can be found at their website. It should be noted that when this attraction first opened in November, there was a minor injury while riding in the superhero position. Supposedly, a man hit his head when braking at the end of the ride. Details were murky then and still are, but the bottom line is that the superhero position was temporarily halted. 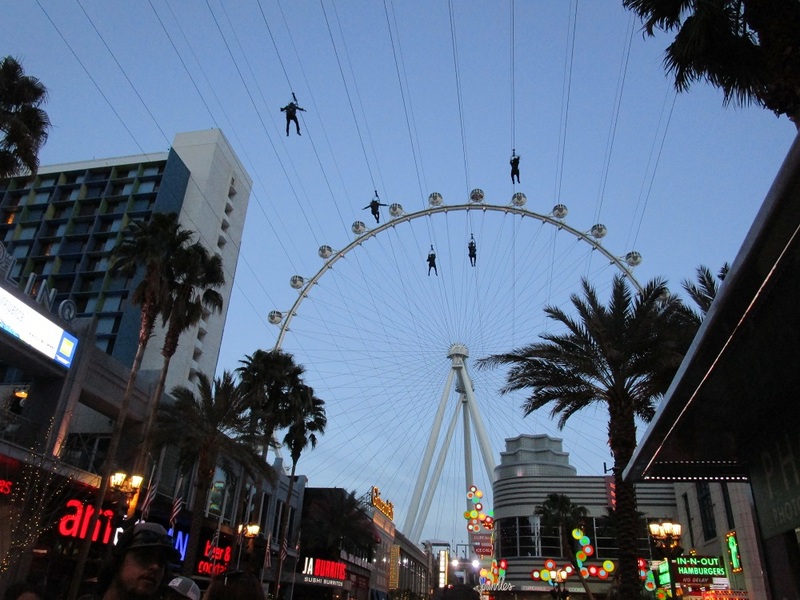 However, last Saturday, I was at the LINQ Promenade watching people ride the zipline, and not once did I see anything but seated riders. So the superhero may still be unavailable. I mentioned in my book, Things to Do Off the Strip: Away from the Neon Lights, that we had a Triple-A baseball team here in Las Vegas. 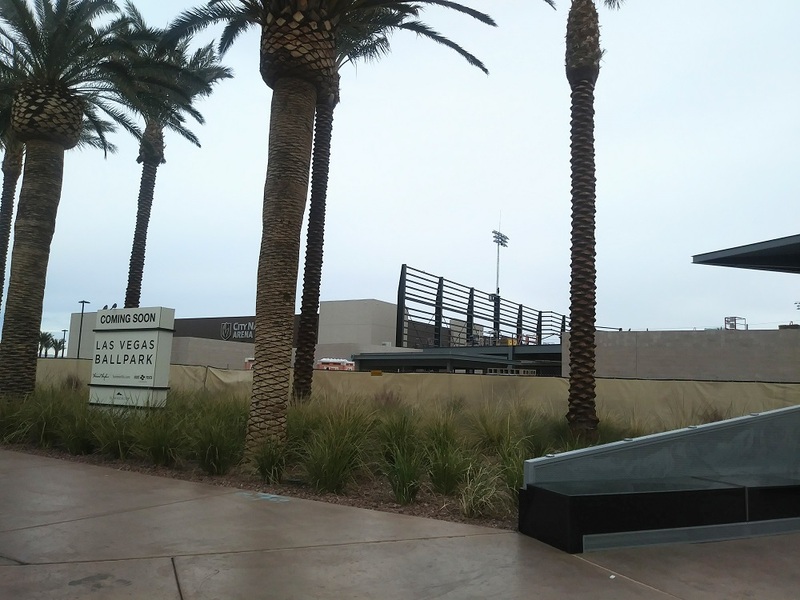 Located north of Downtown Las Vegas, the 51s played their games at Cashman Field. The stadium had a reputation for being one of the older parks in Triple-A baseball, and the player facilities were poor. The Howard Hughes Corporation had a half interest in the team and was able to buy the other half a couple of years ago. 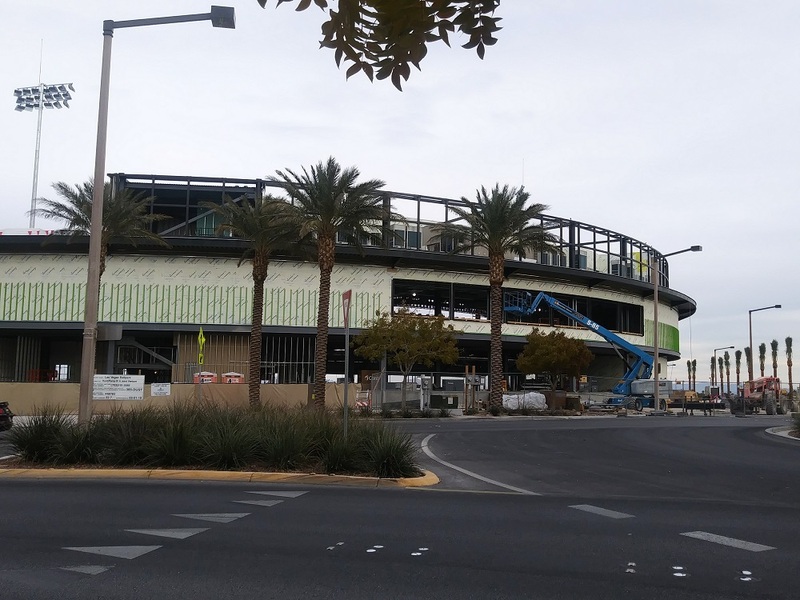 As a property developer with land in Summerlin, they began to build a new stadium. It will stand across from Downtown Summerlin and next to City National Arena, where the Golden Knights practice. At the time of this writing, the new stadium is near completion, and the team has been renamed the Aviators. Most likely, this is in honor of Howard Hughes, who, among many things, was a pilot. They will also be switching their affiliation from the New York Mets to the Oakland A’s. The team will begin playing in the spring of 2019.